You are here: Home / vendor relations / Legal vendors / Need Assistance From CRIV? Submit Your Request Online! Need Assistance From CRIV? Submit Your Request Online! As you may already know, CRIV offers assistance with vendor-related issues to AALL members. 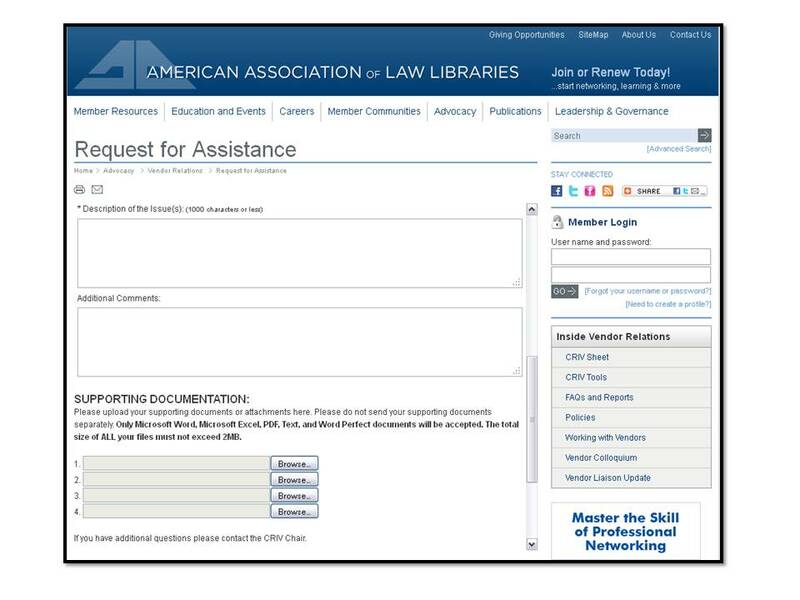 AALL members who would like to make an official request for CRIV assistance are able to submit their requests using our form available at http://www.aallnet.org/mm/Advocacy/vendorrelations/CRIV-Tools/request-assistance.html. In addition to providing general information about the issue, members can upload supporting documents in the following formats: Microsoft Word, Microsoft Excel, PDF, Text, and Word Perfect. For more information and tips on Vendor Relations please visit http://www.aallnet.org/mm/Advocacy/vendorrelations.aspx.